“Brilliant military strategist” are three words that have never been used to describe me, primarily because they would be a great big whopping lie. In Risk, my goal is to seize the territories with the coolest sounding names—which is why I will always defend Kamchatka with every ounce of military power I possess, typically while the entire continent of North America is pried away from me piece by piece. With games like chess, while I understand what each piece does and how it moves, I’ve never been able to think several moves in advance. My general approach is to move a piece at random and see what happens. I like to think this makes me a wild and unpredictable opponent, but in reality it makes me more like the guy who stops to pick his nose in the middle of a barroom brawl. But you know what? For all my tactical incompetence, I can at least grasp some of the “bigger picture” facets of warfare—like, say, how the goal is to win. And how the best way to win is by defeating your enemy. And how the best use for weapons is to aim them at the enemy and not yourself. That last one is fairly obvious, right? I mean, as a general, you wouldn’t want to arm your troops with high-powered bazookas only to later find a smoldering crater where home base used to be. That means your troops decided to use their own tents as target practice, and that maybe you should have given that Bazooka Safety Training Class after all. It just makes sense—weapons are for using on the enemy. That’s obvious. When Paul lists the components to the armor of God, there’s only one offensive weapon: “the sword of the Spirit, which is the word of God” (Ephesians 6:17). We take up this sword to do battle, not “against flesh and blood, but against principalities, against powers, against the rulers of the darkness of this age, against spiritual hosts of wickedness in the heavenly places” (Ephesians 6:12). It’s a battle that cannot be seen with the eyes or heard with the ears—a battle waged in a spiritual realm against the forces of evil itself, where the rules of mankind’s warfare rarely translate the way we expect. This is a weapon with no rival. We’re told it has the capacity to cut down to the very core of its foes—and wielded the way God intended, nothing can stand before it. But what is the way God intended us to wield the sword of His Spirit—the very word of God? The sword of the word was given to us as a means of “casting down…every high thing that exalts itself against the knowledge of God” and “bringing every thought into captivity.” We’ve already established that this is a spiritual war whose primary battlefield isn’t a physical one—it’s not as if we’re called to march out and topple literal strongholds. Where, then, are the strongholds Paul writes about? Where are the arguments and the high things and the disobedient thoughts? David was concerned about searching out and destroying “any wicked way” that had cropped up within his heart—and we know from the prophet Jeremiah that the human heart is “deceitful above all things, and desperately wicked” (Jeremiah 17:9). If there are spiritual strongholds, if there are disobedient thoughts, if there are things exalting themselves against God, then that’s exactly where they’re going to be hiding. 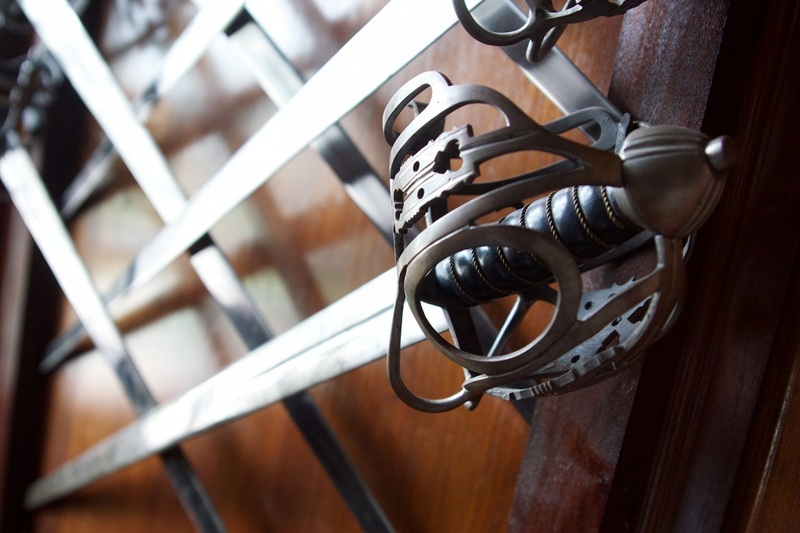 …And we have a sword specifically designed to pierce its way right to the hidden thoughts and intents of the heart. I don’t mean to imply here that there is no external warfare to be waged. I’m not saying that all we have to do is meditate hard enough until we’ve overcome our own shortcomings. But I am saying that unless we’re using the sword of the Spirit on our own hearts and minds, we’re not using our God-given weapon to its fullest extent. When used and studied on a regular basis, God’s word does something incredibly unsettling in the heart of a disciple. It starts to show us who we are—slicing like a well-honed blade through all the facades, all the self-deception, all the smokescreens, revealing who we are at the core of our being. And because we’re flawed, imperfect human beings, that core is going to show us some pretty ugly things—in effect, the very sins and lurking temptations that threaten to bar our entry into God’s Kingdom. Is it pretty? No. Is it something we enjoy seeing? Absolutely not. But it’s something we need to see, because we can’t afford to stay blind to the things going on within our own hearts—and it’s the living and powerful word of God which makes that possible. The battle will be long, it will be difficult, and will bring us to the brink of defeat time and time again. But God has given us the sword of His Spirit—a weapon that, if we are brave enough to use it, will enable us to keep Paul’s charge to Timothy: “Fight the good fight of faith, lay hold on eternal life, to which you were also called and have confessed the good confession in the presence of many witnesses” (1 Timothy 6:12). At the end of this battle is a reward prepared by God for us—a reward that will make every moment of this fight more than worth the blood, sweat, and tears we put into it. To arms, my friends. To arms! 9 Responses to "The Heart of the Matter"
You may not be a general but you are a talented and skilled blogger. Another thought provoking and encouraging article. Thank you for your service and love towards Gods people. My husband Isaac Khalil and I enjoy reading your blogs on sabbath thoughts. Thank you very much, Natasha! Happy Sabbath! Thank you so much for your Sabbath Thoughts! It is always enjoyed and much appreciated! Thanks for the kind words, Mrs. Maskrid! Thanks Jeremy for your thoughts on the sword of the spirit. Our small group has been going through a bible study series on the Armor of God by Priscilla Shirer and your thoughts are and fit exactly with the study. Jeremy – We love your “Sabbath Thoughts”! Even from the archives – We read them every Sabbath morning – and MANY I print and keep for future encouragement! I don’t know which Church of God you are attending, but you have been and are helping and encouraging a great many people! We send our love and appreciation to you, Mary, and Primrose! Thank you from all three of us! It means a lot to hear that 🙂 Happy Sabbath!